This article includes a step-by-step guide to install Planet MMA (UFC Finest) Addon on Kodi 17 Krypton. Find out how to stream UFC / MMA matches on Kodi. 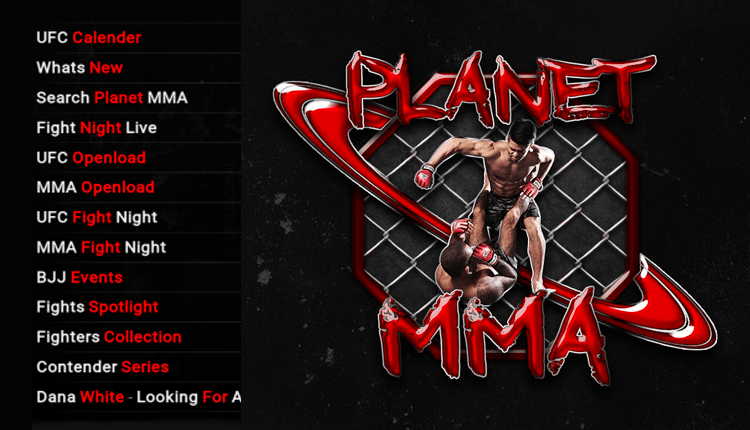 Planet MMA (UFC Finest) it’s a great kodi addon to watch UFC / MMA Live and on-demand. This Kodi addon provides you the following options in the main menu: Fight Night Live; UFC; MMA; TUF; UFC Fight Night; MMA Fight Night; BJJ Events; Fights Spotlight; Fighters Collection; Contender Series; Top Ten; Dana White – Looking for a Fight; Fight Motion; Born To Fight; FirstPerson; 3rdDegree; MMA Mindset; Soundwaves; Where Are They Now; The Exchange; Pioneers of MMA; MMA Movies; UFC Retro; Ultimate Fighter Series; Tapout Series; Youtube; Documentaries; Learning Technique; UFC Lab; MMA Randoms and Test Area. As you see, everything about UFC and MMA is in this fantastic addon! This article includes a step-by-step guide to install Planet MMA Kodi Addon on Kodi 17 Krypton. Note: To highly improve your chances of finding a stream, it’s really important that you use a VPN. Your ISP (internet service provider) blocks your access to free streams, mainly PPV streams. A VPN will make your traffic anonymous so your ISP won’t be able to see what you are streaming and so they can’t block you access to the stream. Here is the best VPN service for Kodi. If you’re looking for more UFC / Boxing addons check here our list of the best UFC kodi addons. Hope this tutorial on How to Install Planet MMA Kodi Addon, have helped you. Have a nice day!